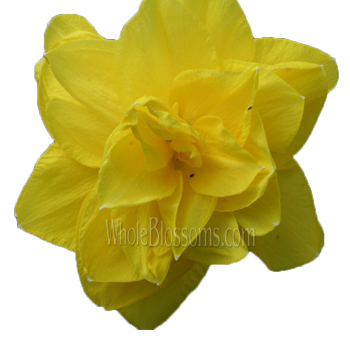 Daffodils are seasonal, springtime favorites at Whole Blossoms. They symbolize friendship, bearing trumpet-shaped blooms set against star-shaped petals in the back. Many use them for wedding centerpieces and bridal bouquets. They are also known by their botanic name, Narcissus. They are also referred to as Lent Lilies and Jonquils. They have limited availability when in season, beginning in January through the month of April. They are carefully packed at the farm in 10stem bunches and shipped directly to you for maximum freshness. Narcissus belongs to the genus of the perennial spring plants. Its most familiar names are Daffodils, narcissus or jonquil all used to describe flowering plants from this species. The Narcissus is a six-petalled flower with tepals that are trumpet and crown shaped. These flowers are white, yellow, pink and orange in colors. 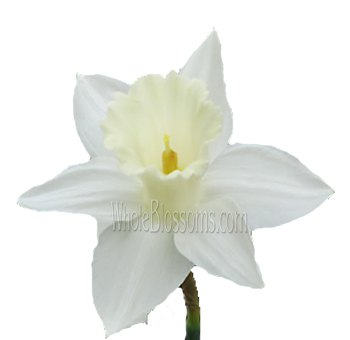 The narcissus mainly blooms from late winter to early spring in the northern hemisphere. Spotting these beauties growing everywhere in the wild is easy. The beauty of these plants is that their patches may last for decades. So, since they naturalize easily, you can find a patch of daffodils in old homesteads, barns, riversides, farmlands, and roadside. Narcissus is the perfect perennial. It meets an exact list of requirements. It's wonderful, practically indestructible and easy to care for or grow. It increases annually and grows in a vast range of climatic conditions. Daffodils, therefore, are the most classical flower there is. 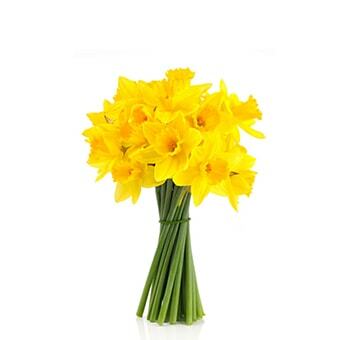 Nowadays Daffodils are extremely popular as cut flowers. People have increasingly started using them as ornamental décor in special events and weddings. White daffodils are a hit at white weddings. The narcissus daffodils have a long history of breeding. As a result of that, there are thousands of different hybrids. Horticulture has classified them into divisions that include a wide range of colors and shapes. These flowers produce alkaloids like the other members of this genus. This means that they are a protection system for the plant but probably dangerously poisonous if ingested. However, humans have found a way around. We've found a way to treat Alzheimer's as well as Dementia through traditional healing with these properties found in flower. It's a flower that holds a lot of meaning and symbolism and is also a considerable part of a lot of cultures, art, and literature. Daffodils symbolize a range of things like good fortune, spring and even death. It's the national flower of Wales. It's also the symbol for many cancer charities. Many festivals too are associated with the bloom of these flowers in spring. During the daffodil season, they are very much in demand. When fresh and in season, the perfect gift to anyone would be a daffodil bouquet. They make the perfect little ensemble when paired with some fillers and foliage. Daffodils are mostly white or yellow in color. However, some are also pink or orange or bicolored. Some are scented, and some are not. Horticulturists have divided them into categories based on colors, shapes or flower forms. Large-cupped Daffodils are the ones you're probably most familiar with. They are suitable for almost every possible use. They even come in shades of pink, red and orange. 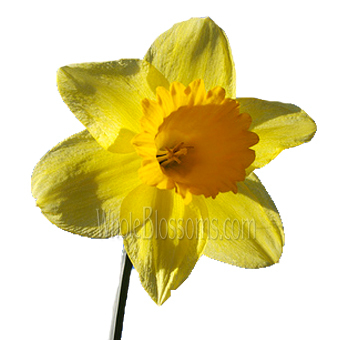 Double Daffodils have a central cluster of petals instead of a crown or trumpet. They make a rose like a form and per stem can have as many as 20 flowers making them very showy. The Daffodils that love the hot sun are the Jonquilla Daffodils variety. They thrive in the Deep South and some colder parts of the country. This variety has narrow grass-like leaves and a small cluster of flowers atop each stem. Miniature daffodils are exactly like their name suggests. 6 inches or shorter these flowers are a petite package. They have two or more flower per stem and are absolutely beautiful in flower arrangements. 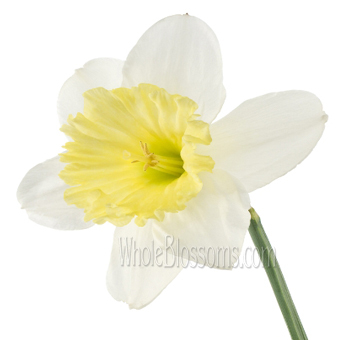 The poeticus daffodils are incredibly radiant with white petals that have a spicy fragrance. These take a while to flower and are best grown in the cooler parts of the country. Many are heirloom daffodils as terrific for bouquets. 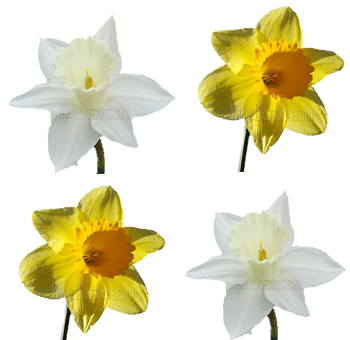 On the other hand, small cupped daffodils are a beautiful cut flower since each stem has one flower. The cup of the flower is more than one third the length of the petals. There are many more varieties and hybrids of Daffodils, but these are some of the best when it comes to cut flowers. Daffodils are an easy flower to fall in love with. If you're planning to incorporate these beauties into your special event or wedding, there's no way you will go wrong. A generally loved flower, they are increasingly being used for ornamental purposes. White daffodils, as well as other colors, are being used in wedding décor or in the hands of the bride for the bridal bouquet. They provide all colors ranging from yellow daffodil bloom delivery to even white daffodil bloom delivery. They are perfect for being creative and coming up with statement pieces and flower arrangements. However, you must make sure that you are purchasing them from the right wholesale vendor. 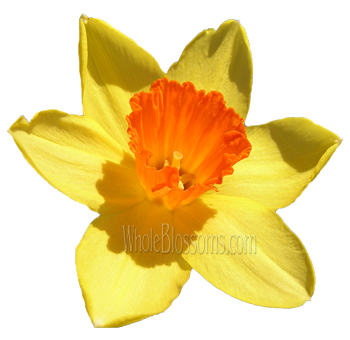 For this, we suggest you order daffodils online from trusted wholesalers like Whole Blossoms. They guarantee a fresh flowers delivery, right to your doorstep! They even have a 24/7-hour delivery which is a game changer for all you event planners out there. Budget and service friendly, we highly recommend that you purchase Daffodils in bulk from whole blossoms for your next event.